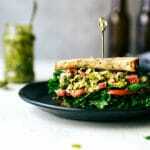 The quickest pesto chicken salad sandwiches. 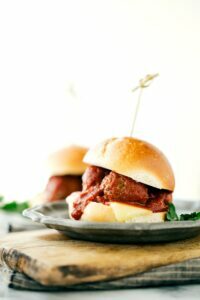 These sandwiches are fast and easy to make and taste so delicious! 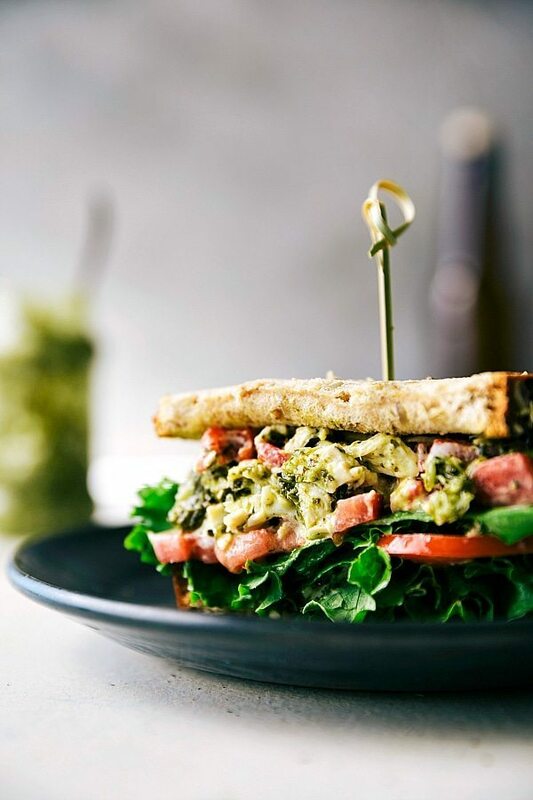 Chicken salad sandwiches are one of my all-time favorite things to eat. For some reason they don’t get made too often in the fall/winter, but come summer time we make them all the time! 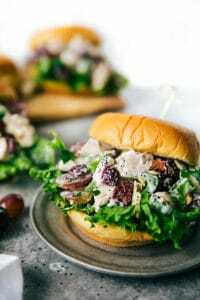 I just barely shared these regular chicken salad sandwiches which are our favorite (and they happen to be low in calories!). A couple days after making those, I was craving them again and thought it would be fun to make a different version. One look at my dying basil plant (black thumb here ??) and I thought of adding some pesto in the chicken salad sandwiches. And honestly, it was one of the BEST decisions ever. 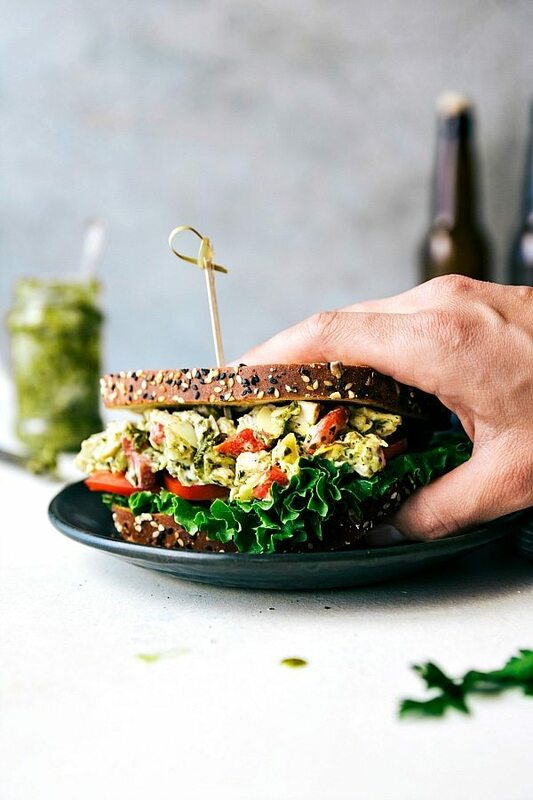 This is one heck of a chicken salad sandwich that I think you’ll be craving all summer long after just trying it once! Since my basil plant is half dead, I decided to use prepared basil pesto for these sandwiches. After that decision, it was all about making these sandwiches as quick and as efficient as possible. They honestly take no more than ten minutes from start to finish to make! That said, you can make them a bit more homemade (and also more time intensive) by making your own pesto, roasted tomatoes, and/or cooking your own chicken. If you’re looking for the quick version though,here it is! We use a rotisserie chicken (I get the rotisserie chicken that has already had its skin and bones removed by the bakery so SUPER quick), prepared basil-pesto, jarred roasted tomatoes, and prepared mayo. I’m not kidding you when I say fast! 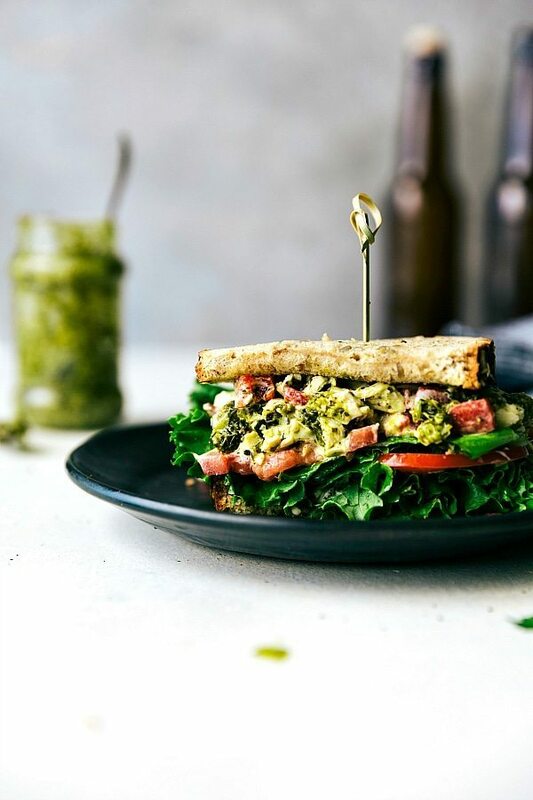 And other than those ingredients you’ve just got the actual sandwich toppings — cheese, tomato, lettuce, avocado… whatever you like on your pesto chicken salad sandwich. I like to use a rotisserie chicken that has already had the skin and bones removed, but if not, remove those and shred or cube the chicken. Take 1 canned roasted red pepper and finely chop. Toss the cubed chicken, finely chop red pepper, prepared basil pesto, mayo, and sliced almonds in a bowl. Mix until completely combined. Season with salt and pepper. If desired add in the fresh parsley. Make your sandwich! Top the bread with the filling and then whatever you like on a sandwich -- tomato, cheese, lettuce, avocado, etc. Love this sandwich so much! This is my dream lunch. Great photos and the pesto looks absolutely marvelous. But I’ve never eaten chicken sandwich with roasted peppers before. It must be delicious. Ps: your photos are getting more and more beautiful. Love them!